391 Beacon is located on the south side of Beacon, between Fairfield and Gloucester, with 389 Beacon to the east and 393 Beacon to the west. 391 Beacon was designed by architect Frederick B. Pope and built ca. 1869, one of ten contiguous houses built as five symmetrical pairs (377-379-381-383-385-387-389-391-393-395 Beacon), each house on an 18 foot wide lot and each pair united by a shared portico. 377-379 Beacon are one story higher than the other four pairs, and probably were built that way (they appear as such on the 1887 Sanborn map). The ten houses were built for speculative sale by a consortium of Frederick Pope, who was both an architect and a builder, and George Martin Gibson, a builder and contractor. They shared the same business address at 81 Washington in 1870. Frederick Pope purchased the land for 377 Beacon on March 18, 1869, and George Gibson purchased the land for 379-381-383-385 Beacon and 389-391 Beacon between March and August of 1869. Once the houses were built, they sold them to individual buyers. The land for 387 Beacon was owned by real estate investor Charles Uriah Cotting, and the land for 393-395 Beacon was owned by dry goods merchant Eben Dyer Jordan, co-founder of the firm of Jordan, Marsh & Co. In these three cases, the houses were constructed by Frederick Pope and George Gibson under agreements with the land owners, who then sold the houses after they were built. The land for all ten houses originally had been part of a parcel purchased from the Boston Water Power Company on January 29, 1866, by a real estate investment trust formed by John Templeman Coolidge, Franklin Evans, and Charles Henry Parker. The trust subsequently subdivided the property into lots, which it sold to investors and builders, who then frequently resold the lots to others. Click here for an index to the deeds for 391 Beacon. On July 31, 1869, 391 Beacon was purchased from George Gibson by Charles Sprague Lincoln, an attorney. He and his wife, Louise Edna (Plimpton) Lincoln, lived in Somerville. On January 1, 1870, his brother-in-law, Dr. Samuel C. Hartwell, a physician, acquired a half interest in the property. He and his wife, Ellen (Plimpton) Hartwell, lived in Southbridge. On September 24, 1870, 391 Beacon was acquired from Charles Lincoln and Samuel Hartwell by John Sumner Williams, a widower, his unmarried sister, Ann Dowse Williams, and their sister, Mary Sumner (Williams) Langley, the wife of Samuel Langley. They all previously had lived at the Norfolk House hotel. John Williams and Samuel Langley were both retired merchants. John Williams died in May of 1881 and Samuel Langley died in January of 1882. Mary Langley and Ann Williams continued to live at 391 Beacon. Ann Williams died in December of 1899. John Williams and Ann Williams had left part of their interests in 391 Beacon to Mary Langley and part to their sister, Helen H. (Williams) Gillingham, the widow of Caspar Gillingham. She had died in June of 1892 and her interest was inherited by her only child, Anne Williams (Gillingham) Seaver, the wife of Jonathan Mercer Seaver. On January 22, 1900, she transferred her interest to Mary Langley. Mary Langley died in July of 1901. 391 Beacon was not listed in the 1902-1904 Blue Books. On October 12, 1903, and November 17, 1903, 391 Beacon was acquired by Miss Fanny Peabody Mason. She lived at 211 Commonwealth and purchased 391 Beacon to provide a home for her friend, Emma Adaline (Bixby) Vermyne, the widow of Dr. John J. B. Vermyne. Mrs. Vermyne previously had lived at 480 Beacon with her niece, Alison (Bixby) Hill, and her husband, composer and music professor Edward Burlingame Hill. Miss Mason converted the property into five apartments, one for Mrs. Vermyne and a second for another friend, Miss Charlotte E. Ellis, and Miss Ellis’s cousin, Susan Davis Ellis. Two more units probably also were made available to friends or may have been rented out. The fifth apartment, in the basement, was occupied by the “choreman” who took care of the property. 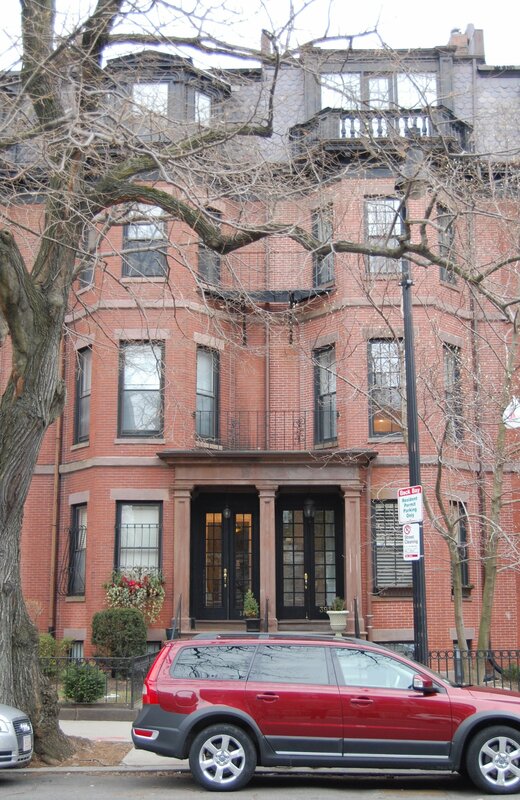 By 1907, Miss Mary W. Ellis, Charlotte Ellis’s sister, also lived at 391 Beacon. Mary Ellis had moved by 1910, and Charlotte and Susan Ellis moved soon thereafter. In 1930, one of the apartments was occupied by Miss Sally Fairchild and her unmarried brother, Gordon Fairchild, a stock and bond broker. John Singer Sargent was a friend of Sally and Gordon Fairchild’s parents, Charles and Elizabeth (Nelson) Fairchild. He made several paintings of Sally Fairchild and at least one of Gordon Fairchild as a child. By 1931, they had moved to 241 Beacon. Emma Vermyne continued to live at 391 Beacon until her death in June of 1933. She also maintained a home in Francestown, New Hampshire. There appear not to have been any other longterm residents in the other apartments. After Emma Vermyne’s death, 391 Beacon appears to have been vacant except for Alex Carabine and his wife, Ann (Myers) Carabine. 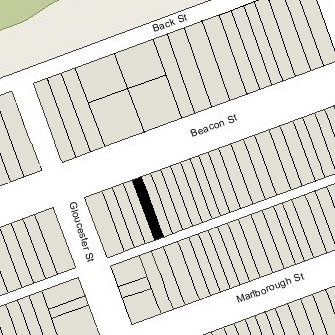 He was the “choreman” at 477 Beacon and occupied the basement apartment. The house was not listed in the 1934-1937 Blue Books. On September 29, 1936, 391 Beacon was acquired from Fanny Mason by real estate dealer Ray C. Johnson, and on December 14, 1936, it was acquired from him by Fannie (Itzkowitz/Asquith) Lang, the wife of Clarence Edward Lang. The Langs lived in Winthrop. Clarence Lang was a real estate dealer and Fannie Lang operated the Fannette Gown Shop at 85 Newbury. On February 19, 1937, Fannie Lang transferred a one-half interest in 391 Beacon to her brother-in-law, Sally Dinn, the husband of Jennie Augusta (Itzkowitz/Asquith) Dinn. They recently had emigrated from Germany and lived in Winthrop. 391 Beacon was shown as vacant in the 1937 City Directory. In May of 1937, the Building Department noted that the house appeared to be being converted into five apartments. Fannie Lang provided affidavits and evidence proving that the building was, in fact, a five unit building when she purchased it and had been so for more than the past thirty years. On August 9, 1941, Sally Dinn transferred his interest back to Fannie Lang, and on August 21, 1941, she transferred the property to herself as trustee of the F. I. L. Real Estate Trust. On January 15, 1946, 391 Beacon was acquired from Fannie Lang by Miss Elizabeth Krauss. She lived at 115 Beacon and later at 141 Beacon. On February 17, 1998, 391 Beacon was purchased from the Elizabeth Krauss 1998 Charitable Remainder Annuity Trust by Clarendon Associates LLC (Harold Brown and Enrique Darer, managers of record). March of 1998, Clarendon Associates applied for (and subsequently received) permission to convert the property from five units to two units. In June of 1998, it applied for (and subsequently received) permission to demolish an existing two-story structure at the rear, probably the addition approved in 1962 for Elizabeth Krauss. 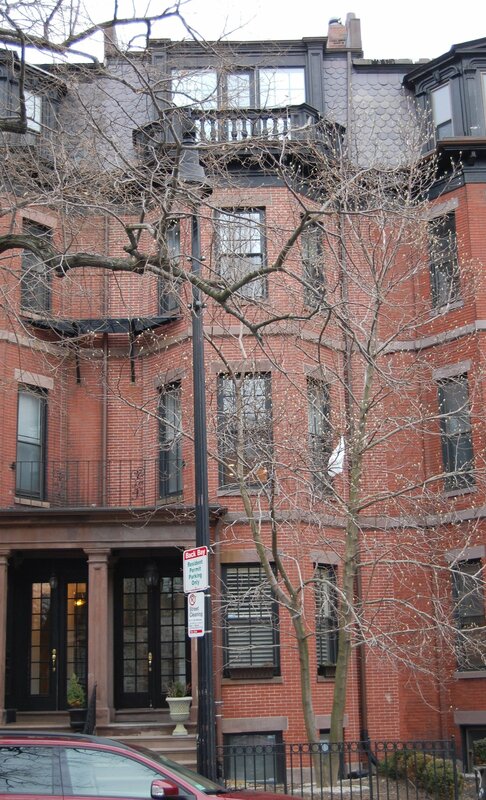 On April 12, 1999, Clarendon Associates converted the property into two condominium units, the 391 Beacon Street Condominium.